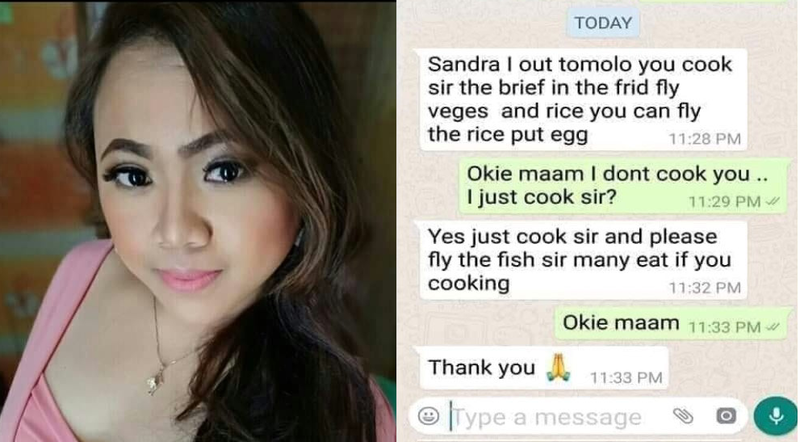 A conversation between the OFW and her employer really amused netizens. Valleryn Caranza Landong who came from Bato, Camarines Sur is now working in Gelang Patah, Johor, Malaysia. Just like some other Filipino workers around the world, she easily learned to adapt to her new job and to the people around her, especially to her employer. Though her employer couldn't speak proper English, still she managed to put things well despite of language barrier. This recent conversation of her and her employer will hilariously blow-up your mind. It seems that her female employer is going for out of town and she texted Landong to cook for her husband, and the conversation ended up hilariously.